On the 26th anniversary of Ukraine's independence from Moscow, U.S. Defense Secretary Jim Mattis sharply criticized Russia as an international menace and said the Trump administration will not accept Moscow's annexation of Ukraine's Crimea region. 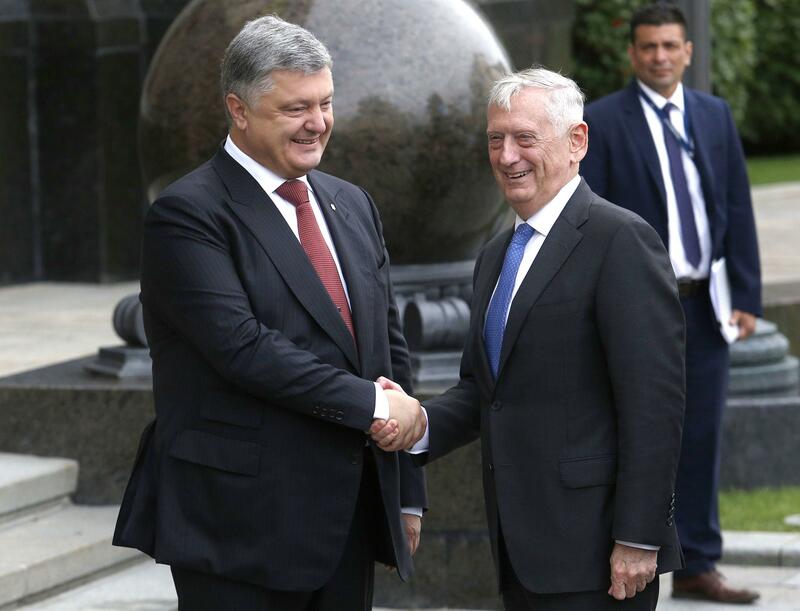 After attending a raucous and colorful independence day parade, Mattis met with President Petro Poroshenko and other top government leaders. He is the first Pentagon chief to visit the former Soviet republic since Robert Gates in 2007. "Despite Russia's denials, we know they are seeking to redraw international borders by force," Mattis said, an ambition by Moscow that Mattis said is undermining sovereign European nations and stirring tension. Mattis ticked off a series of international agreements and commitments that Moscow has made since the collapse of the Soviet Union in 1991, including a two-year-old accord known as the Minsk Agreement, which lays out a roadmap for reducing the conflict in Ukraine that has claimed some 10,000 lives over the past three years. He also cited other Russian commitments to Ukraine dating to 1994. "Unfortunately, Russia is not adhering to the letter, much less the spirit of these international commitments," he said. In June when Poroshenko visited the White House, he lauded the U.S. for continuing to apply pressure on Russia for violating his country's territorial sovereignty and stood by the framework of the Minsk Agreement to halt the fighting in the Donbass region of Ukraine. When speaking to reporters at the Ukrainian embassy in Washington during his overseas trip, Poroshenko said he did "not consider it necessary to change the Minsk and Normandy formats of negotiations." The Associated Press reported earlier this month that the Trump administration has reopened consideration of long-rejected plans to give Ukraine lethal weapons. In his remarks alongside Poroshenko, Mattis said the U.S. is committed to helping Ukraine build and modernize its armed forces, but he made no mention of providing lethal arms.